The way your pool cover is joined together can have a large impact on how long your swimming pool blanket will last. We’ve been in this business for quite a few years now and one question that comes up from time to time is “Do all pool covers have joins? Why?”. All solar pool covers do have joins. Solar pool covers are the most popular and the most cost effective of all pool covers, so for the rest of this article will be discussing solar pool blankets. 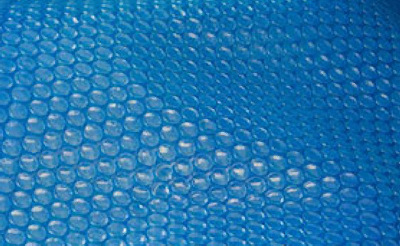 If you’re not familiar with solar pool covers, they are the pool covers that look like a large piece of bubble wrap. They are very effective at making your pool water warmer (up to 8 degrees), reducing evaporation, reducing cleaning time and reducing your pool running costs (electricity and chemicals). Why Do Solar Pool Covers Have Joins? When a pool cover starts its life in the factory, it starts off as plastic pellets. The pellets are then put into a machine and out the other end comes a large sheet of pool cover. The pool cover width is limited to about 1-1.5m wide to make handling easier and because the machines have physical limits to how wide they can make the piece of pool cover. This is obviously smaller than most average size swimming pool. Since pool cover material is only 1-1.5m wide when made, several pieces need to be joined together to fit the average size swimming pool. Just like curtains are joined together to make a larger piece of material, pool blankets can also be joined by being stitched together using a special sewing machine. Stitched pool covers can be a little cheaper but not much. And in our opinion, it’s not worth the small saving. This is the preferred method of joining a solar pool blanket. All high quality covers are joined this way. These covers are joined in the factory using a special heat welding machine. The two pieces of cover are heated until melting point. They fuse together making a join. The result is a join that is stronger than the original piece of material. When you’re shopping to buy your next pool cover, consider the type of joins. We always recommend a swimming pool cover with welded seams. If you have any experiences or comments about the seams or joins of pool covers, please leave your comment below. I’m looking for weld seam thermal pool cover that is 22’x38′ to be able to cut to form. All I find are stitched covers that don’t hold up to mormal use without unraveling. Who sells what I’m looking to buy?